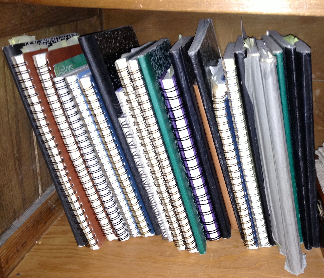 I’ve kept journals/diaries/writers notebooks/daybooks for nearly all my life. My writer’s notebooks help capture moments in life, whether personal or professional. I can pull out a notebook from years ago and the writing there will place me right back in that time, place, feeling. It’s great to re-visit those good times with family and students. In my classroom, I wanted to help my students create the habit of writing, and writers’ notebooks are how we began. Students spent the first day of school with me mostly outdoors. In addition to games, sharing silly and serious things about ourselves, working in groups or alone, we wrote. I wanted them to know that writing was important in that capturing of thoughts, feelings, observations, and explorations. By the end of the year, they had filled a notebook (or more than one) to return to again and again for more ideas, to read previous thoughts compared to current thinking, and to enjoy all that they had recorded. A first assignment began with a poem I shared that they could tape in their notebooks. 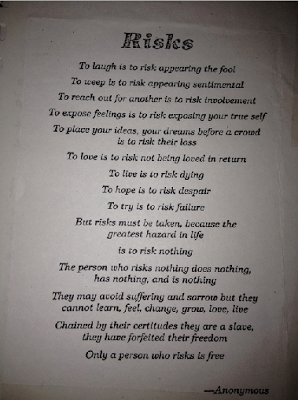 Here are a couple of photos sharing two poems used. Here’s a sketch I did of students writing. 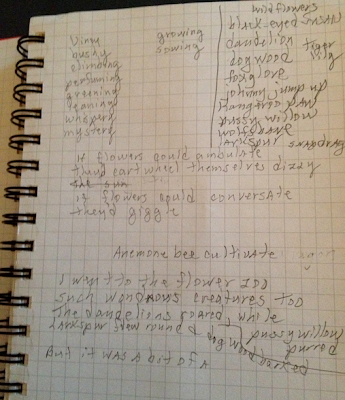 In addition to a current notebook, I keep a separate notebook that holds lessons I use for both writing and poetry. 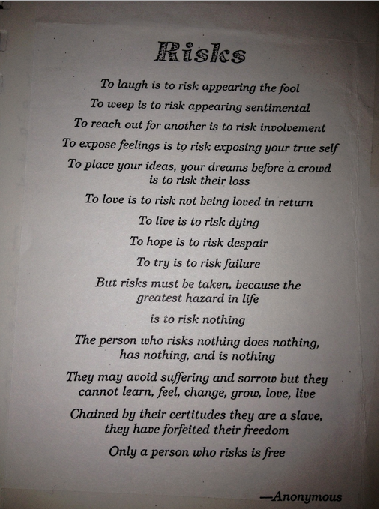 One example is copied poems taped in as examples of figurative language. As a teacher, I wrote with students, filling my notebooks with ideas for writing and I wrote rough drafts in them, too, just as I wanted students to do. One idea that helped students find ideas was a “day in the life” assignment. Our students at school also keep sketch journals, and I encouraged my students to sketch in their writers’ notebooks as well. This “day in their lives” was to list, and occasionally sketch, the time from getting up in the morning, eating breakfast, looking out their bedroom windows, traveling to school, walking around school, going home (or to lessons or practice or friends’ houses), doing homework, watching TV, going to bed and reading, going to sleep. They created timelines in their notebooks and with each part, wrote more ideas that might be good ones for future writing-favorite foods, memories of bedtime rituals, riding in the car, watching out car windows. I wanted them to know that everything in their lives was worth writing about. I sketch often in my notebooks, to record ideas, to remember moments I might want to write about later. I carry smaller notebooks with me wherever I go. I found these at a local art store. And now, as a literacy coach, I share notebooks or lessons about notebooks with those teachers with whom I work. 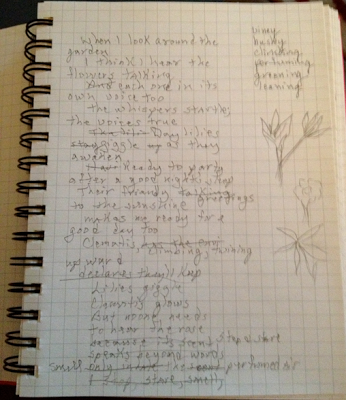 I have a new notebook begun this summer, and have been writing lots of poems. I begin in this notebook with an idea, and mess around with it until some idea or other works, for me at least. Lately I’ve been participating in a poetry swap and I have such beautiful flowers blooming in my garden, I decided to write a flower poem. I wrote many lines and nothing seemed to work. I took pictures, sketched a little, tried to make the flowers “whisper” (I liked that line! ), but I couldn’t seem to find any other “words” they might say. I filled numerous pages with lines about flowers. Finally, I thought I’d do some research, and looked up flower parts, thinking maybe they would help spark an idea. I listed verbs showing actions by flowers, like “climbing, perfuming, opening” and still, nothing. That seems to be the way of writing, sometimes ideas don’t work. I put away my notebook until another day had passed, and did some more research. There was a page full of common flower names, and some of them caught me! They were names of animals, like ‘tiger lily’, and more! I had my idea, and worked on it, moved some lines around, and wrote. Here are some of the earlier pages I wrote. we held our Baby’s Breath until we arrived at the Garden Zoo! and next we saw Kangaroo Paw jumping around his cage. Imagine our surprise when next we heard the howling of Wolfbane. It sent a shiver down our backs; we’ll never be the same. with the extraordinarily shapely look of quieter Foxglove. Remember these were wildflowers at our Garden Zoo. And we understood quite clearly, they wanted to be Freesia too. 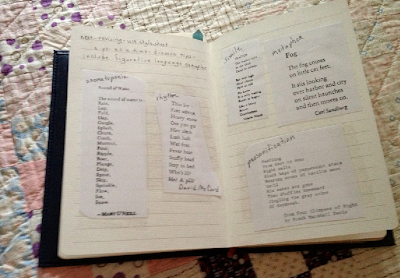 Sitting and messing about with words, doing research, finding new ideas is all part of using notebooks. I carry them always, searching for new writing ideas. I have a lot of empty notebooks, waiting to be filled. I’ll send one of these to a winning commenter! I’ll choose a special one, with lots of pages, ready for your own special writing! Linda Baie is a long time teacher of middle school students at an independent school for the gifted in Denver, Colorado. She has recently moved from the classroom and moved into the part-time position of literacy coach for the 8-14 year age group. She has a son and son-in-law, a daughter and daughter-in-law, one grandson and two granddaughters. Her husband is retired. If there is any passion it is reading, writing and being outdoors. For a long while, Linda rode horses, but has been lately too busy to take care of a horse so had to give it up. Maybe someday she will return. She blogs at TeacherDance. 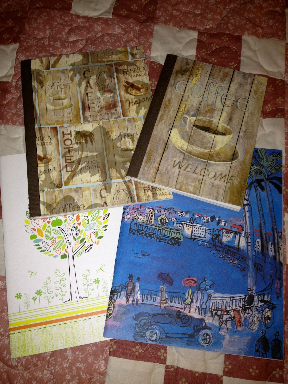 Please comment with a way to reach you to be entered into Linda's notebook giveaway! The winner will be announced in this space and on The Poem Farm Facebook page on Saturday, July 20. Thanks for the ideas. I write with my students outdoors but never thought of starting the year that way. A student lived next door to the school and his mom had made their front yard into a garden. 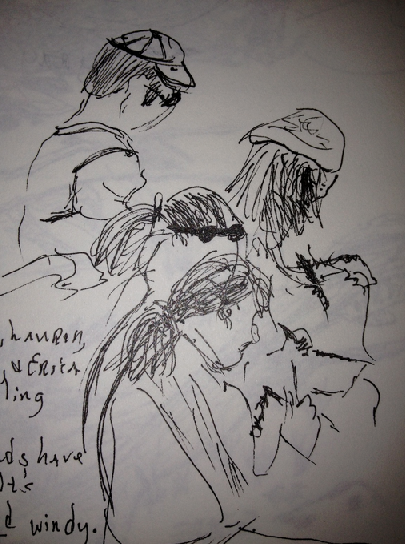 She gave us permission to sit and write near the garden and we also sketched it. It was a fantastic prompt for them to use. Your idea of using the garden sounds wonderful. Being outdoors just adds some relaxation for that nervous first day! Thanks Kristina! Sounds like you already have the notebook habit! 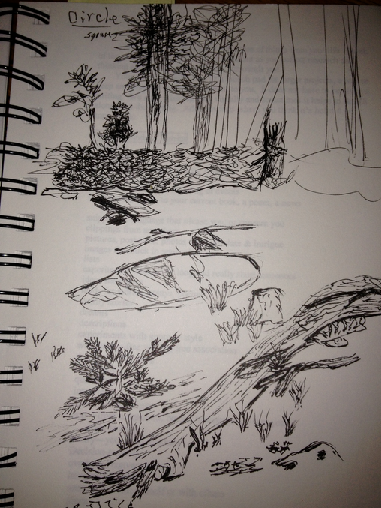 Sometimes I think it's good to sketch because it slows the thinking down and then word ideas come too! Thanks for the comment, Jess. How wonderful to read how you use notebooks - great inspiration for me! Thank you! You're welcome, Carrie. I hope you took away some ideas to use for your own writing! Thanks for reading. Thanks Catherine. Some days the word brain just doesn't seem to 'find a way'. I'm so glad too, to hear that you must have this happening sometimes. I'm excited to start using interactive notebooks with my students this fall. I love the idea of a poetry collage to keep favorite examples of poetic devices and may have to steal that idea for my kids! One question: Can you explain how your poetry swap works? Thanks! Hi Jennifer, please take all you think would be helpful. As for the poetry swap, there is a wonderful person who blogs and participates in poetry Friday and she sets it up for those who would like to be in the group. She sends us the deadline and who to send a poem too, so we write "for" that person and send the poem by a deadline. Very fun to do, and of course, to receive! Thanks for asking! I'm so happy to hear that you'll use some of the ideas. I've found my ideas from many, many people through the years and am thrilled to share. When I do share those poems, I also had students write responses to them, and then they shared some of those with the class. It was a lovely 'getting to know you' time. Thanks, Stefanie! Hi Deb! And thank you for saying it's a good post to pass on. I appreciate your words. What fun it must be to help teachers in a class about writing. Best wishes to all! Linda, That sounds like a wonderful idea. I am going to school to be an english teacher and i would love to get my students excited about writing. 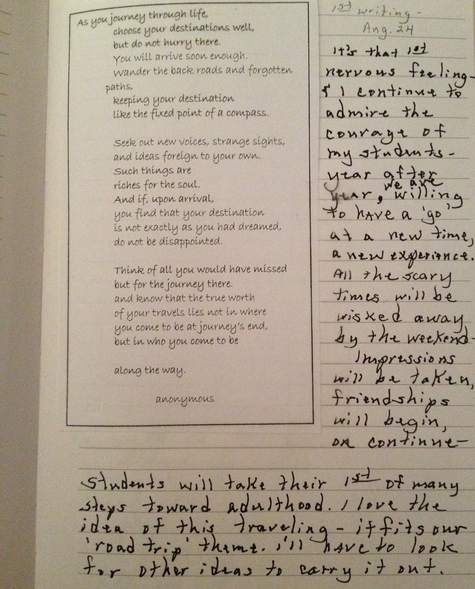 I have always kept journals so i would love to be able to pass that down to my students. Thank you for your ideas! Thanks, Emily. I hope you'll use these ideas to help you get started and then find some others too. Best wishes to you in getting ready! Thanks very much, Beth. Hope you'll takeaway good ideas for your own use! Your post is wonderful and so thoughtful! I love the idea of starting outside more than one time in the lab that we have. Allow it to become part of our writing tradition not an event. Why hadn't I thought of that. Thanks for sharing. Thanks Maria. I hope you will be able to get outside, and often! It is just a relaxing way to start and on such a day of nervousness-that first day! Oh, how do you know I keep another notebook for to do lists and it must have pockets, for all kinds of things, little poems to share, etc. I think that it would be great to have a writers notebook for your things too, and I'll have to create one. I don't think I've ever seen a journal with pockets. Thanks so much for the idea, Mary! And of course you can say 'pick me'. Maybe it will bring good luck? Hi Renee, you are so welcome! Without having a real conversation with you about this, I think you're right about rules, there are just too many ideas from different people (adults and children) to try to make them all line up the same. I think freely sounds good, and fun! Thanks you for sharing your thoughts on the notebooks! 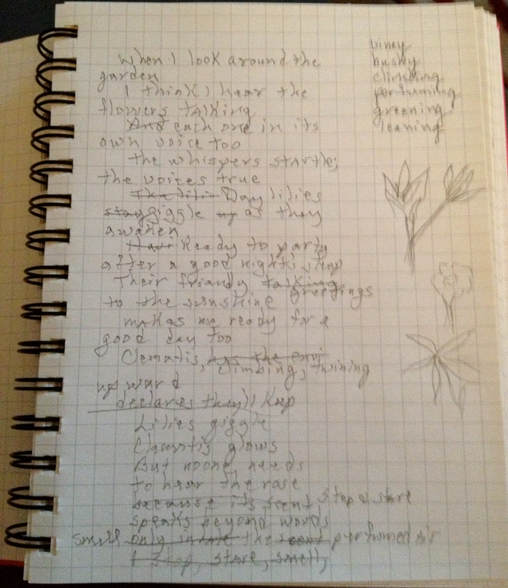 Thank you for sharing a peek into your notebooks. I have just started to live a "writerly life" and started a notebook for the beginning assignment of Teachers Write! I can't believe how ideas have just exploded. Last night I even hopped out of bed to write something down because I didn't want to forget the idea. I have even started a blog and ideas for Slice of Life has its own page in my notebook. I enjoy reading and learning from your blog too! Thanks for sharing! Great story, Leigh Anne! So glad to hear all this 'writing' news. I'll be sure to look for you! Thanks for this delightful peek into your notebooks, Linda! I love the idea of having students keep a notebook, but I struggled with how to implement it last year. My own notebook keeping is rather sporadic, and a lot of it is actually digital on Evernote, so it was hard to imagine what kinds of activities to do with students in notebooks, aside from heart maps and some sensory pre-writing activities. The "day in a life" exercise will definitely be something we do early this fall! During my local Writing Project Summer Institute, I also learned a lot about using quick-writes to get started on lots of different kinds of pieces that could then be revisited later and finished. So now I have all sorts of good ideas! I always love peeking into your classroom, Linda! I hope my post will help a bit, Jennifer. As you can see from one of my comments above, I did more with those beginning poems that first day, too, and on from there. The Day In The Life stuff continued through several weeks, and I did use quick-writes too. They work great, I think! Glad you found some sources! Thank you! I love your flower poem, Linda! I enjoyed hearing how it unfolded -- you reminded me of Laura S.
Thanks Tabatha. It was fun when I finally found the right path! What an inspiring teacher you are, Linda! Through your sharing, many students will benefit as teacher-readers put your ideas into practice. I adore the Garden Zoo poem -- so clever! Thanks for sharing your process! I find it so helpful to see how other writers work! Thank you Keri. Your words are nice to hear. Yes, the swap is fun! I have always been a writer, albeit sometimes ashamed to admit it. As a teacher waiting for my own classroom, I cannot wait to write with my students, making it an activity we share, not just one I expect them to do! I often find myself drawing stick figures of joyful moments with my own daughter (in lieu of your sketches). I only hope that she enjoys writing as much as I do! Thanks Crystal. I hope you find a wonderful classroom that you enjoy! And if you're already doing things to capture memories with your daughter, I imagine she will grow into a writer like you! Best wishes! I saved this post to re-read after I had attended Bonnie's NWP session, and I am so glad that I did! You notebooks, in their variety and in the obvious satisfaction you take from keeping them, are such powerful testaments to the value of living a writer's life. You observe, you keep notes, you reflect, you dream...and your notebooks become a sort of Pensieve (to borrow from dear, old Harry Potter), if you are wise enough to keep them and tend to them, as you do, Linda. Thank you for giving us a glimpse! Thank you for your thoughtful response Tara. I do love doing all this, and I loved doing it with students too! I was talking about you today, telling my colleague Max to look for your post about slicing. He's going to do it with his students this year! It all goes together so beautifully, doesn't it? I absolutely love that you teach your students to keep notebooks. And that you teach them to write outside. And that you teach them to use their notebooks freely for thoughts, sketches, other people's poems, etc. I have drawers full of old notebooks! So glad you came by, Liz. I'd love to see you share your notebooks. It's quite wonderful to return to old ones, isn't it? 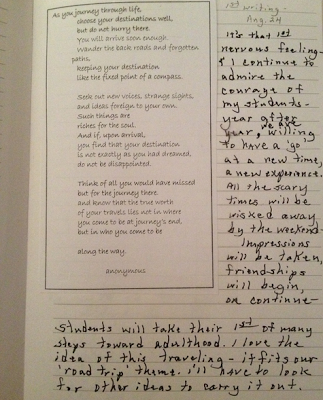 The notebooks were the heart of all I did with my students, and, with some exceptions, I know they loved them too. Thank you! The best teacher is the one who learns with their students. Kids need modeling and inspiration, you provide that with your writing with them. You helped me plan a part of my day...write outside. Thank you Kristen. It's just glorious to sit outside with a notebook, noticing! Hope you have a very good day! 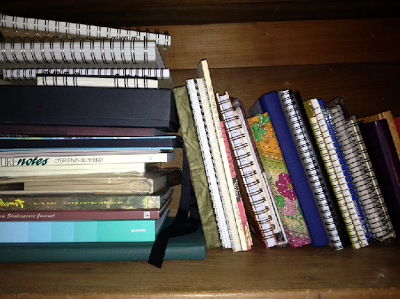 Thank you for sharing how you keep notebooks. I enjoyed seeing the process of your poetry creation and your excellent poem. What do you plan for the future for your notebooks? I enjoyed seeing the sketches. I'm so glad that you are still coaching. You're a fantastic teacher and mentor. Joy, I've never even thought of any 'future' for them, just re-read, pulling words that I like and might use again into newer journals. Now you've really given me food to 'chew on'! Thank you! I love getting to peek into your notebooks and your process! I, too, have a shelf full of filled ones and a half-shelf full of to-be-filled ones. My problem is remembering to/finding time to go back and re-read old notebooks!! Time is always an issue, isn't it? I should at least date them on the outside for future reference. Thanks, Mary Lee.